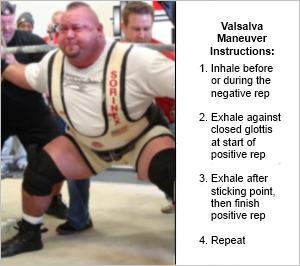 The Valsalva maneuver is a specific breathing technique that you can utilize to immediately improve your weight training performance and safety. It creates a pocket of pressure in the abdominal and thoracic cavities. The results are that you increase your power output potential and provide core support to protect your lower back from injury. That’s a win-win outcome, if you ask me. 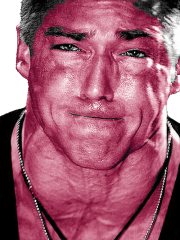 Although the Valsalva maneuver is especially effective for weight training, it’s not a phenomenon restricted solely to the realm of pumping iron. …For example, you will involuntarily perform the Valsalva maneuver if you strain while sneezing, coughing, gagging, tossing your cookies, taking a leak or dropping a deuce (generally unpleasant topics, I know, but I’m just stating the facts here). Additionally, you’ve undoubtedly done it while straining to lift, push, pull or otherwise exert force upon some very heavy object. Heck, you may already be doing it unknowingly in your workouts. Is the Valsalva Maneuver Safe for Weight Training? Even though your body knows how to do this naturally, you may still need some guidance on how to use it voluntarily while weight training. Inhale Before or During the Negative. Start by inhaling before or during the negative repetition. After you’re done inhaling, hold your breath in. Complete the negative repetition. Exhale Against Closed Glottis at Start of the Positive. As you initiate the positive repetition, exhale against your closed glottis – The glottis is a structure in the windpipe that allows air to pass when open, and prevents air from passing when closed. If done correctly, your gut should be pushed out with your abs tightly contracted. How & Why It Works. When the air can’t escape, the result is elevated intra-abdominal and intra-thoracic pressure, which fills the abdominal and thoracic cavities. These pressure-filled cavities “insulate,” and therefore reduces the load on, the lumbar (lower) and thoracic (middle) spine. In other words, you’re able to keep your spine straight and safe. Plus, the built up pressure enables increased power output on the positive rep to help get you through the sticking point. Exhale After Sticking Point & Complete the Positive. You can finally breathe out once you get past the most difficult part of the positive repetition. Breathe however you’d like now; deep breaths, short breaths, whatever you gotta do to get that oxygen circulating (this technique isn’t just about holding your breath the whole time, ya know). Proceed to finish the repetition. Repeat. Repeat the process for the remaining repetitions in your set. Note: If you’re performing a movement that starts with the positive repetition (e.g. deadlift), inhale just before initiating the lift. Then proceed to do steps 2 and 3 before step 1. Many trainees mistakenly believe that the proper way to breathe while lifting weights is to inhale on the negative, exhale on the positive and never hold your breath. Although he doesn’t mention the Valsalva maneuver by name, that is precisely the breathing method for which he is advocating in this clip. This is a great video that details the dos and don’ts of the Valsalva maneuver. This should answer any lingering questions you may have about the technique. Contrary to what some may believe, the Valsalva maneuver is actually quite safe. If you or your family has a history of heart or blood pressure issues, then I urge you to consult a qualified physician before even trying it out. Even if you have sterling health history, it’s always a smart idea to consult a physician prior to implementing any major new training practice. I mean, who knows – You could have a pre-existing heart condition of sorts. Make sure you’re doing it right. Watch the Squat Rx video again (above) to reinforce your knowledge. 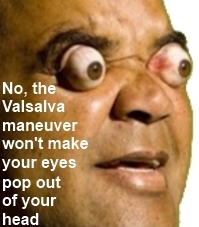 One big thing I like to reiterate is that the Valsalva maneuver isn’t simply the act of holding your breath. You gotta create internal pressure, and yes, you do eventually have to let the old air out and take in some new oxygen! In the unlikely case that you become dizzy, experience blurry vision, feel chest pains or notice anything else out of the ordinary when using the technique, then you should take it easy and lower the weight (or stop altogether). …And just in case you were wondering, NO, you don’t have to worry about your eyes popping out of their sockets from the pressure, or anything of that nature. Thank you, I am a fit body model. I do focus on breathing, but this was very informative. I will help me better when I do deadlifts, to prevent injuries. Thank you. That’s great you found it so useful. It’ll definitely help you when use it in your training–especially on an exercises like deadlifts where core stability is so important. Valsalva maneuver decreases the preload to heart and thus can also result in passing out if done a little longer than it should. Preload basically means the blood moving to heart is reduced and since blood crosses the heart to reach the brain, brain receives less blood and can result in unconsciousness as a result. So be careful and keep breathing and don’t hold your breath for very long trying to push or pull weight in a gym, but just enough to help you execute the workout.